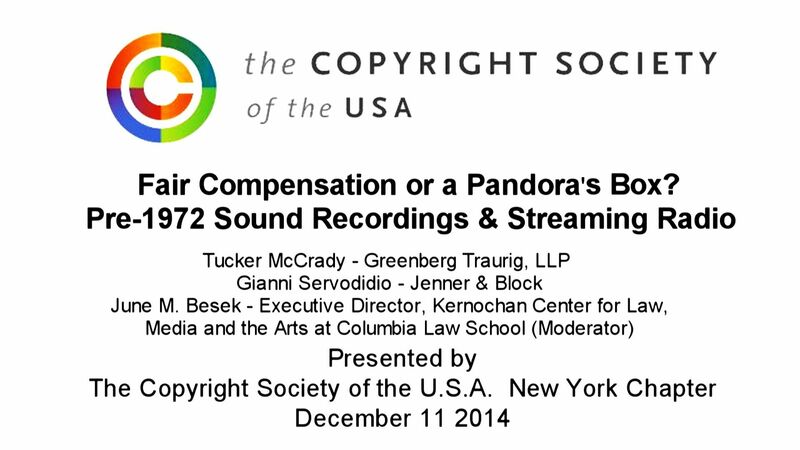 On December 11 2014 the Copyright Society of the USA’s New York Chapter presented a luncheon panel – Fair Compensation or a Pandora’s Box? Pre-1972 Sound Recordings & Streaming Radio – at the Princeton Club in NYC. A panel looked at the legal framework and issues involved in the recent lawsuits involving royalties for webcasting of pre-1972 sound recordings. After providing a background of the key issues, the panel discussed the potential practical impacts of affirmance or reversal of the recent Flo & Eddie decision, as well as whether the state-based issue of common law copyright for pre-1972 recordings is a matter that should be resolved at the federal level. Panel: Tucker McCrady – Greenberg Traurig, LLP; Gianni Servodidio – Jenner & Block; Moderator: June M. Besek – Executive Director, Kernochan Center for Law, Media and the Arts at Columbia Law School. Video/audio is below.